For 20 years Lauren has been teaching and practicing yoga. She shares that the most challenging part of her own personal practice, can be when “life gets in the way” (which is an “easy excuse”, she says). She notices, that if she lets go of that momentum, of having the disciplined regularity of a daily practice, life can easily get in the way, which then further delays her practice. This affects her mostly on the mental level…she begins to notice it in her manner toward herself and then outwardly toward others…she has less tolerance, less patience…this reminds her that she needs yoga because life is so much easier with the practice. When she practices, there is a presence and focus which she feels is so much of what yoga is…this makes her feel “joyful, alive, happy, and inspired”. There is a Being-ness of yoga though…in dedicated practitioners…as if yoga just resides in them somehow, and Lauren is one of these people. She doesn’t put on airs or roll out big yogic vocabulary and names of Gurus, she just naturally sits with yoga. So I don’t know that yoga ever really leaves her, it seems so much a part of who she is. Born in South Africa, Lauren now calls Portugal home. After years of a fairly nomadic start to her teaching, her 5 year base in Portugal now gives her the solid ground to offer retreats in Algarve, Portugal, as well as the freedom to teach overseas in places such as Goa and Morocco. 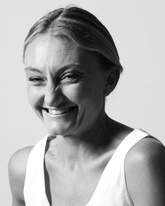 She leads Yoga and Detox Retreats, finding that people become so much more inwardly focused on these retreats. She says it is such an opportunity to go deeper into the practice of yoga as the retreat week progresses…”the practice is so much more focused and inward. Detoxing the body creates a strong exploration of one’s mind which becomes more clear, which therefore helps the yoga practice”. As a Louise Hay facilitator, Lauren shares a lot on self-love…”I feel it’s a huge part of yoga which is why my classes don’t focus on achieving amazing postures; because the thoughts that often go along with that are not kind thoughts. Kindness is what it’s about, why we’re here.” When teaching, Lauren includes a lot of yoga philosophy, subtly, during asana practice. She says that leading a week long retreat allows the time for the sharing of the yogic lifestyle, which is often a missed opportunity in a one hour class. Lauren was a special needs school teacher before yoga came into her life, and at the end of one long day, she was faced with having to return home for an evening of making conversation with a house guest who had long overstayed their welcome (an initial visit of 2 weeks had stretched into 6 months!). Suddenly that yoga pamphlet from the ‘London Mind, Body, Soul Festival’, that she had stashed away in the kitchen drawer a few years earlier, was very compelling. So she told her partner she was going to a class that evening, and he went with her. The class was held at a Sivananda center, and she remembers how lovely the center was and how beautiful it smelled with the incense when she walked in. She found out the center was teaching a beginners’ course, so she signed up…and fell in love with yoga on that first night….because of Savasana, “Savasana was the key. I didn’t know it was possible to feel like that in mind and body. It was something special”. After two years of personal practice she attended a retreat, and it was here that she “just knew” she was meant to be teaching this “magical thing called Yoga”. Because of her previous career experience, Lauren already had a comfort level with teaching. 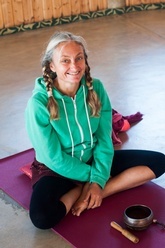 Though she began her training in Sivananda, at an ashram in California, Lauren doesn’t apply a specific school of teaching to her classes, “I have learned so much since then, and had so many teachers that have all been of such great benefit, that I can’t apply just one school of thought”. But if someone needs a name for it, Hatha would be the closest label…”sometimes teaching a gentle class, sometimes dynamic, depends on who I’m teaching. I don’t plan my classes, they just flow from the moment”. I think Lauren is so easily relatable. She finds that her students are comfortable with her too, because she’s comfortable with who she is. There isn’t a need to put on any pretense, “I’m me, I’m real….my Asanas aren’t amazing…I’m normal…and this gives them permission to be normal. And, I REALLY enjoy their company on retreat. It’s not a job”. She does emit an at ease and accepting quality. I asked Lauren about those moments that happen in yoga (in anything we love doing, actually) that can’t be made to happen, they just happen so perfectly on their own, in their own time. She said she experiences these times when she finds herself saying things she may never have said before, “and it’s said with clarity and wisdom”, she somehow hears herself saying something and it’s “true with a capital T…that’s yoga, that’s the connection…Beautiful”. But she is wise, she wears it on her face. This wisdom may be developed from her Meditation practice (which is her favourite part of yoga)…her fondness for Meditation has developed over time, it wasn’t appealing to her in the beginning. She enjoys the systematic approach of yoga, progressing from more gross to more subtle. The importance of Asana practice on Meditation as we move through Asana to Pranayama to Meditation…”where maybe we’ll get a glimpse of the Divine” (she said with a dreamy smile).